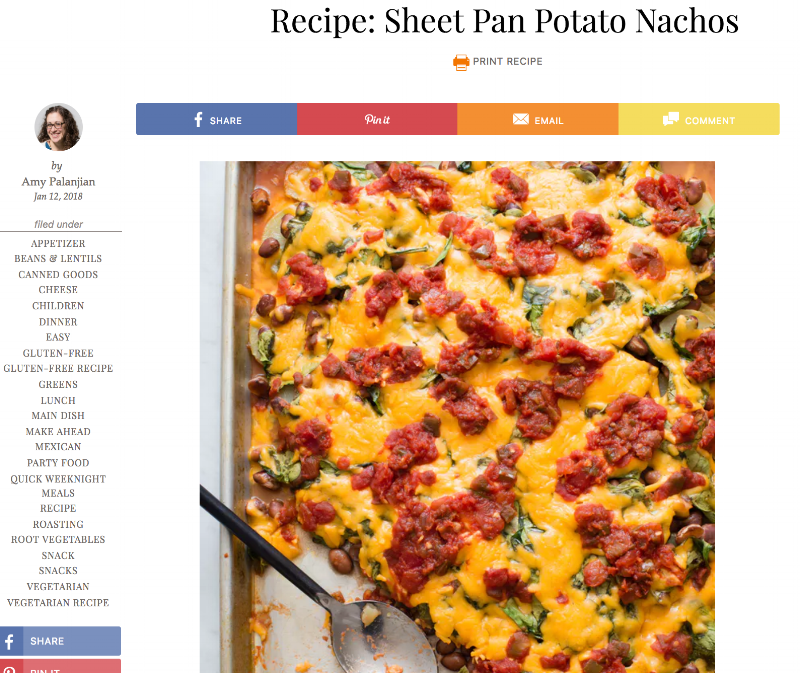 I've been contributing to AllRecipes magazine for the past few months, working on their kids content. My first story is out in print in their latest issue—and it's perfect if you need some lunchbox packing inspiration! Look for it on newsstands near you or here. I have a new series of quick family recipes up on The Kitchn. These are recipes that my family loves and that we make again and again—especially when we're all busy during the day and there's not a lot of time to cook! A few months ago, I had the opportunity to develop 6 recipes for the May issue of Delicious Living designed for expecting and new mamas. There are recipes to enjoy throughout the day and each one is totally family-approved, but packed with nutrients that mamas need. Check out the whole story in the digital issue here. I wrote a post for The Kitchn with one of my habits related to talking about food and the rush of dietary changes in the air this month. I'm all for eating better and taking positive steps to improve our health, but I do think that it's important to remember that how we talk about those changes can also have a big impact. I recently had the chance to write about my current favorite way to entertain for the Kitchn, which I hope helps other parents spend more time with friends! Read the whole story on how to throw a One-Hour Dinner Party after the kids go to bed over on the Kitchn. When Can You Introduce Yogurt to Babies? I'm so excited to share that this week The Kitchn is featuring 5 of my posts with food projects and recipes for Mamas and babies. Follow along for a super delicious Lactation Cookie recipe, hydrating agua frescas, easy meals for the whole family, and feeding tips for littles! I had my first posts go live on The Kitchn this week, which is one of my very favorite food sites, and I loved getting to share a few thoughts about feeding toddlers with a new audience. You can see all of the posts under my author page here, but the topics range from the one thing I've done to relax about my daughter's sugar intake, to why I don't call her picky, and stress-free tips for eating out with little ones. Find the links to the full posts right here. Pick up the latest copy of Better Homes and Gardens for some easy tips on making a prettier bed (and for some really yummy looking healthy recipes!). I wrote up this story a few months ago and I love everything about the mix-and-match style of that bed. And also the wall! I recently worked on this story for Parents.com to help parents of little ones tackle the sometimes loaded issue of starting solids. We share 5 super accessible foods to start Baby Led Weaning (if you choose to go that route over purees) and share tips about food prep and serving sizes. Check out the full slideshow on Parents.com right here. Head to your newsstand now—especially if you are in the midst of deciding which health plan to go with for next year—and pick up a copy of the November issue of Real Simple. I have my first byline for the magazine sharing advice from experts on how to make the most of your benefits, including medical, your 401k, and all of the other perks you may not even realize are available for the taking. The next time you're by a magazine stand, check out the latest issue of Better Homes and Gardens. I have two stories inside—both of which I started working on a whole year ago—that I'm really proud of. This feature is a girls party with stylist Ruthie Lindsay and there's another front of book story on Aimee Wimbush Bourque and her pickling techniques. Check it out!